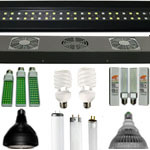 Or scroll down to view Value Grow LEDs! On client request, we've brought back a greatly improved version of our original discount LED bulbs! Compared to our old V1 Value Grow LEDs, these produce nearly double the illuminance numbers at 12in away, while operating at the same overall temperature. 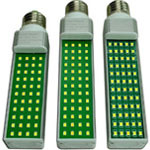 These are a less expensive, single-color temperature version of the other brand of screw-in LEDs we carry, and are a great solution for those who are building on a budget, but don't want to sacrifice plant growth performance. 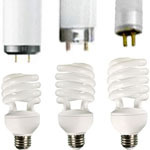 Our Value Grow bulbs produce full spectrum 6400K light while keeping things cooler than equivalent CFL bulbs. In our tests, these LEDs out-performed a SMD5050 "Square Diode" generic screw-in LED by over 50%, and meter roughly 4800+Lux & ~48µMol/M²S at 12in away. 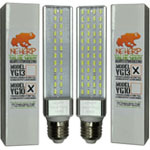 Each LED unit comes with a 1 year NEHERP-backed replacement guarantee. Value Grow LEDs are available at a discount in all Vivarium Lighting Kits for enclosures ranging from 9-26in tall! 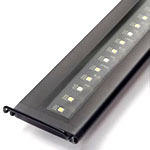 Exo Terra: Value Grow LEDs fit perfectly in each size of the Exo Terra Compact Top. Zoo Med 12in Hood: Value Grow LEDs fit perfectly in the 12in Zoo Med Hood. Zoo Med 18in Hood: Value Grow LEDs are incompatible with 18in Zoo Med hoods. Please remove the metal reflectors in any hood style, for the longest life of these & all screw-in LED bulbs! Our records show that this product has very little or no stock left at the moment, but we're expecting a shipment imminently. If ordered today, we'd expect it to ship within 5 business days. These are a great option for hobbyists on a tight budget. The primary difference between Value Grow & our other name brand of LED is the mixed color spectrum. The less expensive Value Grow LEDs are a solid 6400K, while the higher-end Jungle Dawn brand has a mixed spectrum to produce a slightly warmer look. Still, the price difference of these generic style LEDs can go a long way for some builds, especially for when multiple bulbs will be necessary to get the job done. Our Value Grow super high output grow light LEDs were originally selected for use in our indoor grow rooms, but their through-the-roof performance & statistics encouraged us to begin offering them on the site. We've been using Value Grow Spotlights in tests at NEHERP since 2014, and we're excited to finally make them available. Value Grow Vivarium LED Spotlights are a blindingly bright lighting solution we recommend only for enclosures measuring 25in & taller. In our tests, these 6000K spotlights metered over 525µMol/M²S of PAR light, and 44,500lux at 12in away. Value Grow Spotlights have optic lenses which focus the beam of light to a very tight 60° angle, in an effort to ensure plenty of light can penetrate through even the tallest enclosures. These are an appropriate choice for enclosures over 25in tall, but are too bright for us to recommend using them for anything shorter. 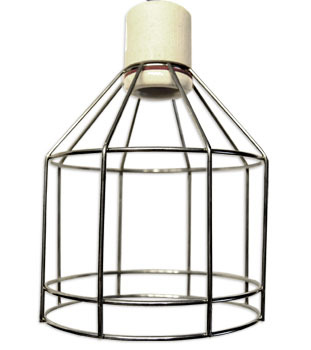 These aren't suitable for use in any closed fixtures, and we highly recommend pairing this bulb with the NEHERP Wire Cage Fixture, available in the drop down menu below. Manufacturer rated 30W driver, 36W chipset. 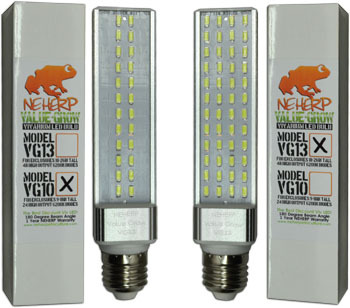 Each LED unit comes with a 1 year NEHERP-backed replacement guarantee. Value Grow Spotlights & Fixtures are available at a discount in all Vivarium Lighting Kits for enclosures over 25in tall! Q: How do I know which to choose to illuminate my vivarium? A: There are two ways to go about this... The most complete way would be to read through our comprehensive Vivarium Lighting 101 article, which will explain pretty much all the basics you'll need to know in order to make an educated decision. Otherwise, we'd recommend checking out our Vivarium Lighting Kits! We've put together discounted kits for every common type of enclosure on the market using all the data found in our article. Q: I saw a high "8,000-10,000K+" rated bulb for X enclosures on X website... It'll work, right? A: Bulbs in that range may have the ability to grow plants, but it will likely look less natural than the 5000-6700K range we recommend. Kelvin is a measurement of color temperature, so higher is not better in this case. Learn more in Vivarium Lighting 101. Q: Why aren't there UVB lights in this section? A: Deciding on whether or not to use UVB bulbs depends entirely on the inhabitant species, as vivarium environments (plants, microfauna, etc) do not require UVB lighting. If the inhabitant species you are working with requires (or will benefit from) UVB lighting, use it! If not, using non-UVB horticultural plant growth bulbs will save a pretty penny, and have the same (or slightly better) results when growing plants. 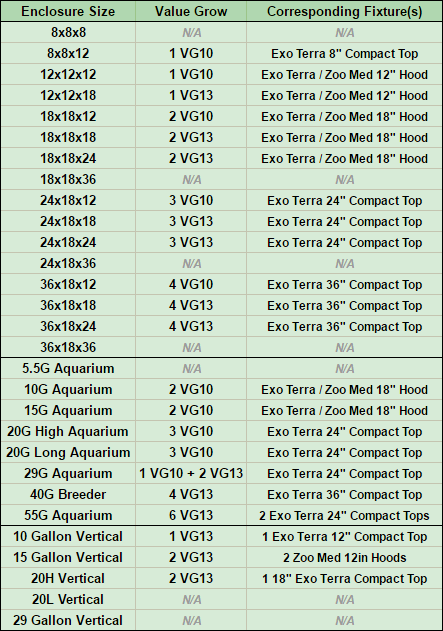 If you aren't sure if your inhabitant species requires UVB, check out the Zoo Med & Exo Terra charts on our UVB bulb page. Q: Why are there no heat bulbs in this section? A: If you need to heat your live vivarium, doing so with heat-emitting bulbs will be tricky unless you are working with very dry-tolerant plants, or with a larger enclosure. Although heat bulbs will quickly boost temperatures within the enclosure, it'll also dry out the air & plants within. Most temperate or tropical vivariums are built to house plants & inhabitants at roughly 70% relative humidity or above. While daytime drops down into the mid 60% R/H ranges are tolerated, placing heat lamps over a screen top will very quickly drop it down into the low 50s (and lower). This will have drastic effects on most of the common vivarium plants used in the hobby, and can also negatively affect microfauna populations. Heat can be more controlled more easily without disturbing humidity by using partial glass tops to cover some of the screen vented top, and keep heat from escaping the enclosure. Adjusting the ventilation larger/smaller will effectively lower/raise humidity and heat within the enclosure. 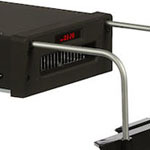 If additional heat is necessary (common if ambient room temperature is cool), increasing the overall temperature of an enclosure is usually as simple as warming the water table in the drainage layer using head pads or heat cables. For tons of info about illuminating a vivarium!